Seventy red squirrels are to be trapped and then relocated to woodland in the north west Highlands as part of a scheme to boost numbers of the animals. Trees for Life began the project in March when it released 33 red squirrels from Forres and Strathspey around Shieldaig in Wester Ross. The Findhorn-based charity is now preparing to introduce 70 reds near Kinlochewe and Plockton. The sites currently have no squirrels, Trees for Life said. The charity, which is doing the work under a licence from Scottish Natural Heritage and with landowners' consent, hopes to establish 10 new populations. The areas involved are too isolated for the squirrels to reach themselves. But the locations do have habitat, and food, favoured by reds and may have supported populations of the animals in the past. The areas are also free of non-native grey squirrels, which compete with the smaller reds for food and carry diseases fatal to the native species. Becky Priestley, Trees for Life's wildlife officer, said: "We are giving red squirrels a helping hand to return to some of their long-lost forest homes. "Many Highland woodlands offer the species excellent habitat far from disease-carrying grey squirrels - but because reds travel between trees and avoid crossing large areas of open ground, they can't return to isolated woodlands without our help." Furry flit: How do you get a squirrel to move house? The squirrels are transported in nest boxes lined with hay and with food and water available, Trees for Life said. Small numbers of the animals are moved from where they are trapped so as to avoid harming the survival of "donor populations". The captured squirrels are also checked for diseases before being transported. At the new sites, the nest boxes are fitted to trees and the exit holes are opened and filled with grass, which the squirrels can push their way through to get outside. Food is provided for several months while the animals become accustomed to their new habitat. 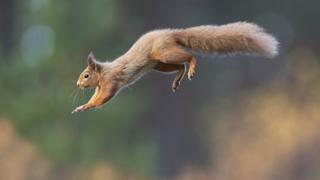 There are an estimated 138,000 red squirrels in the UK, Trees for Life said. Trees for Life said red squirrels introduced to woods around Shieldaig in March have bred and raised young. The new phase of the project will involve animals trapped on land owned by Forestry Enterprise Scotland and others in Moray and near Inverness. They will be relocated to the privately-owned Coulin Estate next to Beinn Eighe National Nature Reserve, near Kinlochewe in Wester Ross, and to Plockton in Lochalsh. Landowners involved include conservation charity the National Trust for Scotland. Red squirrels are not the only native species to be moved from one area to another in the interests of wildlife conservation. In June it emerged that Scottish pine martens were raising young in Wales for the first time in a six year-long project. Twenty pine martens were captured and released into the Welsh countryside last year. The animals, one of Britain's rarest carnivores, were caught by the Inverness, Ross and Skye team at Forestry Enterprise Scotland. At least three of the 10 females captured were thought to have given birth to kits. The capture and release of the Scottish martens forms part of the Welsh Pine Marten Recovery Project. The animals were introduced to woodland owned by Natural Resources Wales and their behaviour is radio tracked. Water voles have also been trapped in Scotland and relocated to England. The Royal Zoological Society of Scotland staff and conservationists have used empty cardboard snack tubes for catching and handling feisty voles. "Sometimes they can be a bit nippy," said Roisin Campbell-Palmer, of RZSS, referring to the mammals' bite. RZSS is involved in vole conservation projects in England and previously worked on one in the Trossachs.